Golden State Warriors players, coaches and owners hold up the Larry O'Brien NBA Championship Trophy after Game 5 of basketball's NBA Finals between the Warriors and the Cleveland Cavaliers in Oakland, Calif., Monday, June 12, 2017. 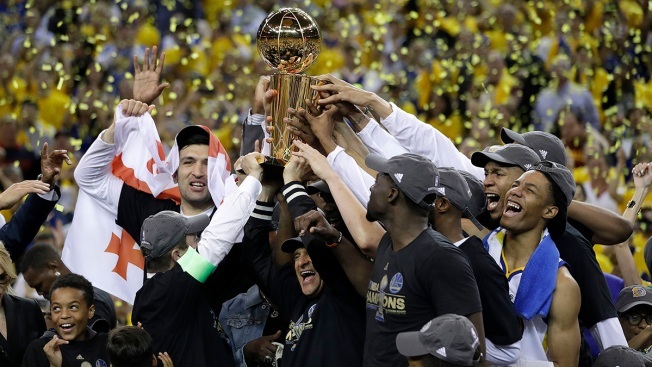 The Warriors won 129-120 to win the NBA championship. James, who in 2012 with Miami beat the Thunder in Durant's only other Finals, wound up with 41 points, 13 rebounds and eight assists. Kyrie Irving followed up his 40-point gem in Friday's Game 4 with 26 points but shot 9 for 22. Durant drove left, right and down the middle, knocked down 3-pointers, dished and dunked. He knocked down a 17-foot fadeaway over James early in the fourth quarter, then assisted on a 3-pointer by Andre Iguodala the next time down as the Warriors pulled away. Durant shot 14 for 20 and Curry — the two-time reigning MVP who took a backseat as the new big star got acclimated — finished off a brilliant postseason. Not to mention a healthy one after his 2016 injuries.